You have exhausted your attic for inspiration for costuming. 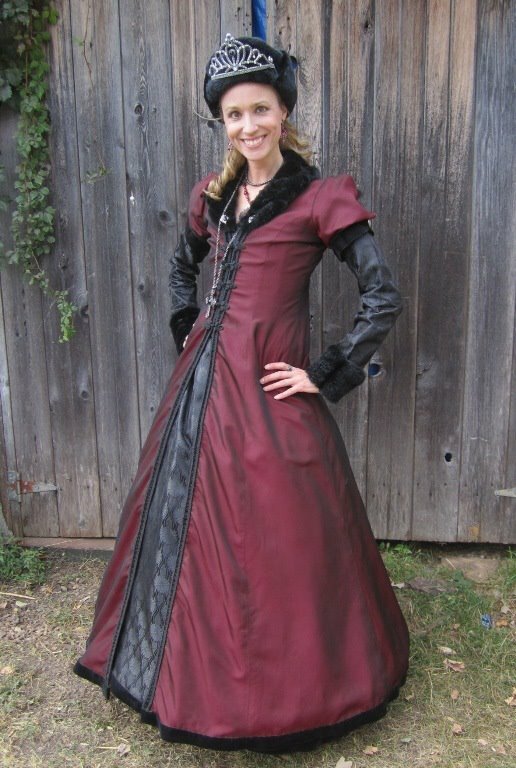 You have used your old wedding dress and formal outfits, leather coats, and those old Christmas tree ornaments. 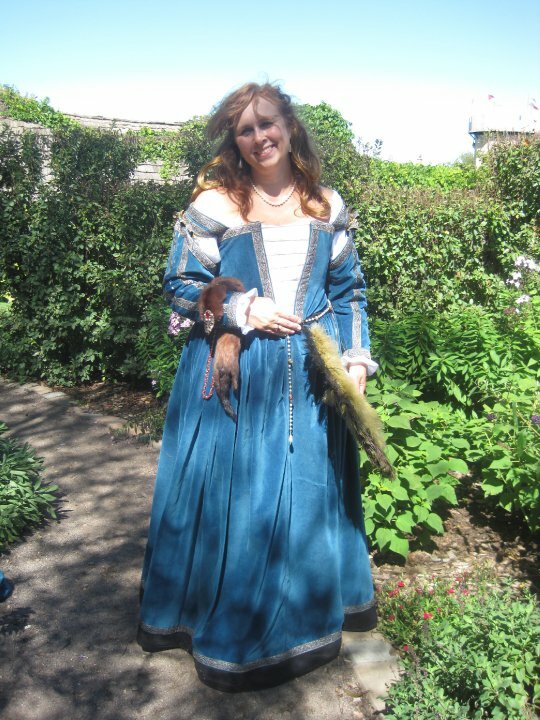 Where else could you possibly find raw materials for use in costuming? The great thing about linens is that they are essentially great big pieces of material, usually with no seams or rips or buttons to get in the way. There is no issue as to sizing, and you are generally assured that they aren’t going to shrink after sewing them, as they have already been laundered multiple times. Sheets, duvet covers, quilts, curtains, pillow covers and placemats are all excellent sources of fabric. 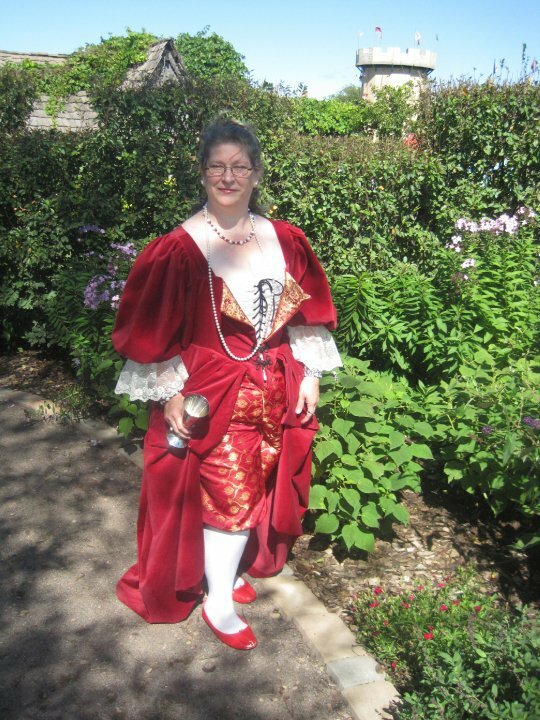 Want to have a fancy beaded stomacher on an 18th century French gown, or as cuffs on an elaborate frock coat? An embroidered pillow cover is an inexpensive and quick way to add bling and luxuriousness to an otherwise plain project. For instance, the sleeves on M’s gown below were made using fabric scraps from her gown and pillow covers that were already beaded and pin-tucked. 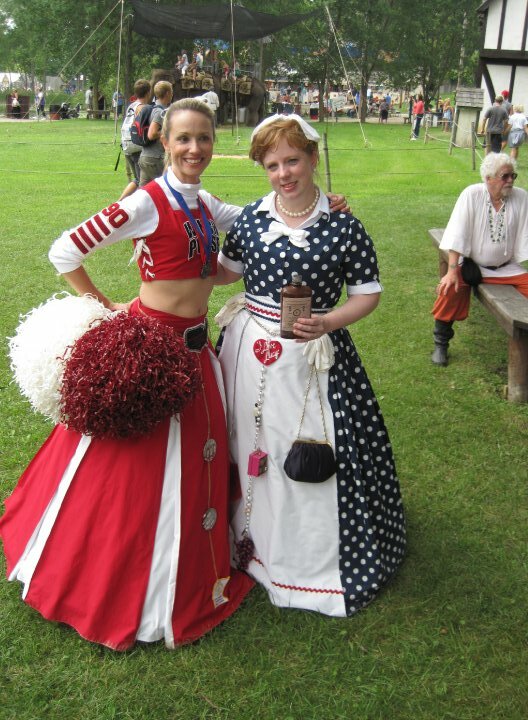 She found fabric that coordinated with this beaded fabric for her underskirt and added beads to it herself to match the sleeves. 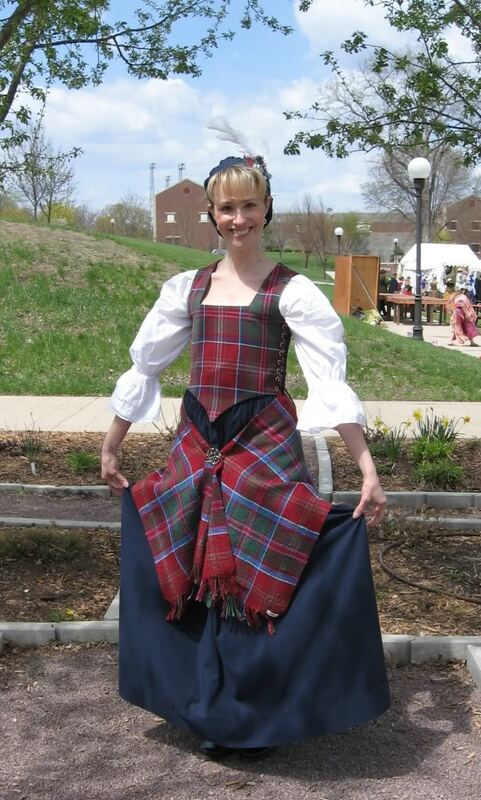 Erin used a rather different sort of textile for her outfit – a towel. The towel and coordinating table runner were woven by St. Croix Weaving in Erin’s family tartan, MacDonald of Glencoe. Erin decided to use the table runner as a shawl, and turned the smaller towel piece into a bodice. Luckily Erin is a wee thing, so the towel was large enough to use for both the front and back pieces of her flat front bodice. What about bed sheets? I used a vintage white bed sheet I had sitting around for my I Love Lucy Elizabethan apron, and the bows in my hair and at my neck. The award for most creative use of fabric from the linen closet goes to Carol, who combined regular fabric yardage with a bedskirt. 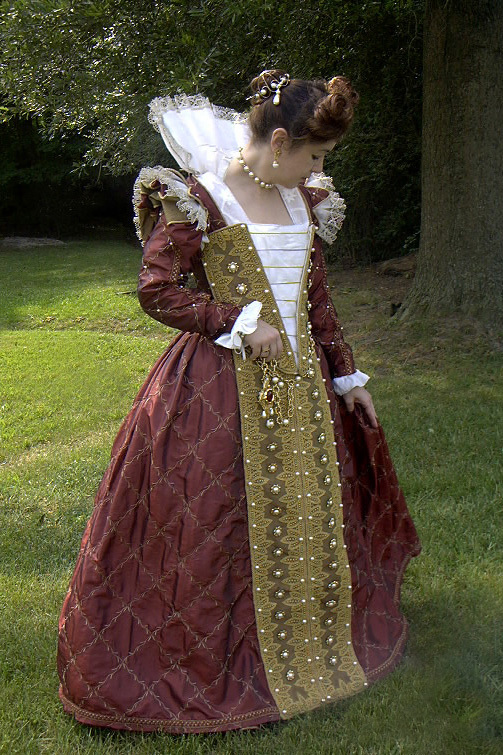 The bedskirt had a beautiful pattern on it that Carol used as bodice fabric, a large hem guard and for gauntlets. By far the most common item people think of using from their linen closets are curtains. Usually large in size, they offer huge swaths of yardage that can quite often be less expensive than purchasing the fabric outright. 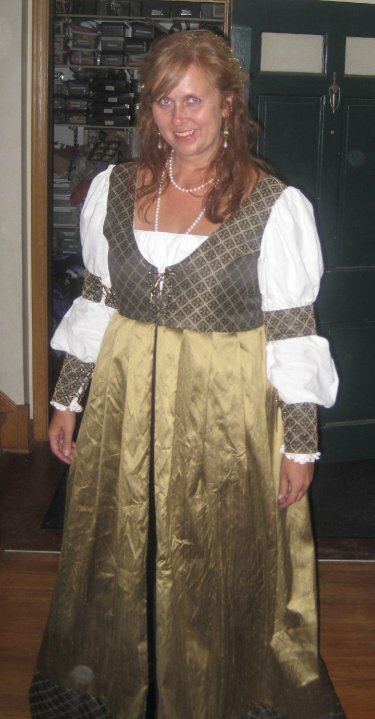 Ikea has been a great source of fabric for members of the Wench Posse over the last several years. In their Scratch and Dent space they often have curtains that were used as display marked down significantly, or they will have shopping carts filled with linens, chair covers, etc. for $15-30 for the entire cart. 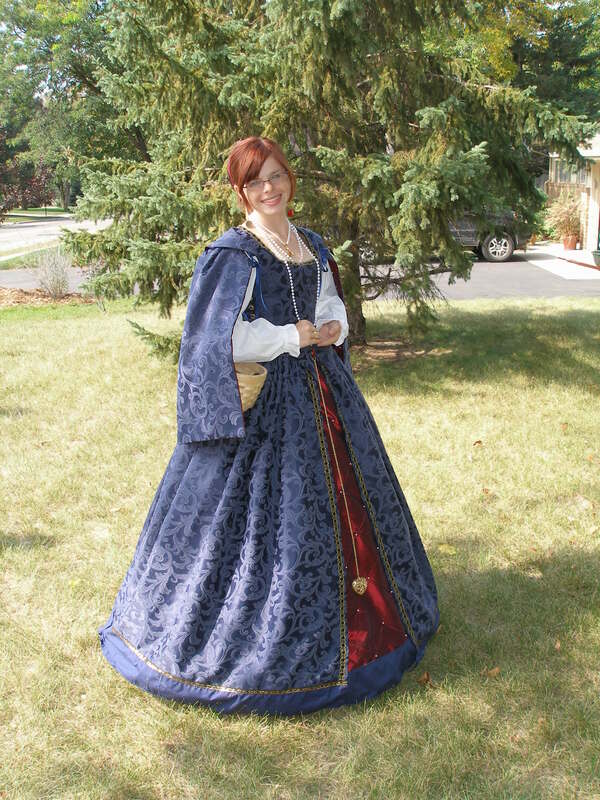 My best find was one of those carts for $15, and I got a heavy canvas curtain I have used for interlining, several cotton curtains I have used for petticoats or regular lining, and 5 sets of full length velvet curtains that have become various Renaissance style gowns. 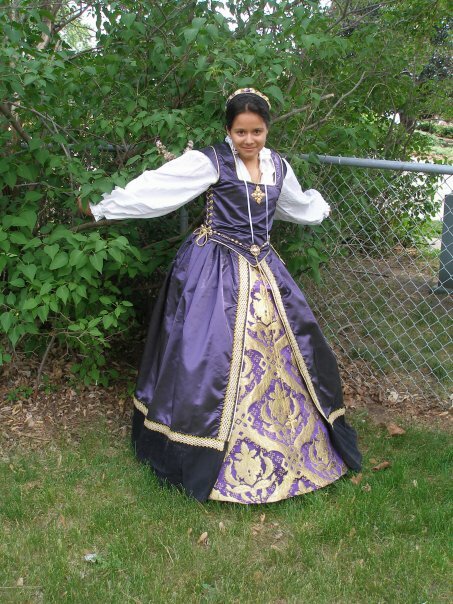 Used curtains can work just as well for costuming, although you do have to check for sun fading on the fabric. Sometimes this can work to your advantage, depending on the affect you are going for. 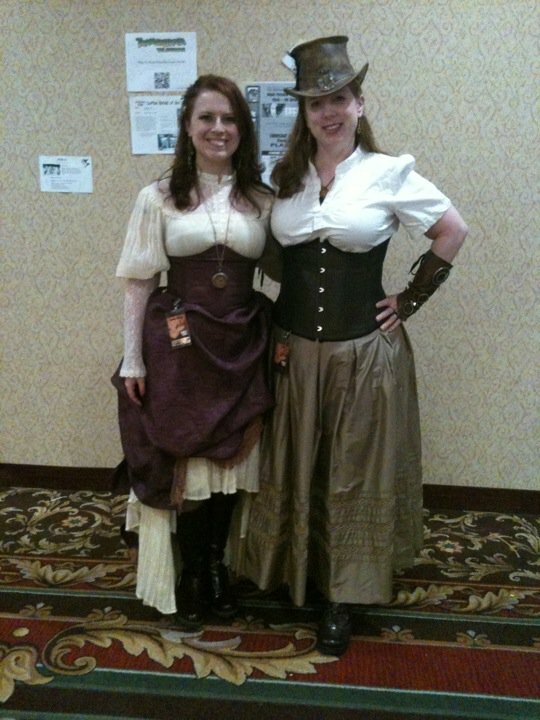 And some old burgundy curtains and valances were used to make an underbust corset and bustled skirt for Ashley for a Steampunk event. The curtains had fringe already sewn to the bottoms, which saved us the time of having to add trim. Ashley paired these items with an old Gunne Sax gown of her Mom’s from the 80’s. 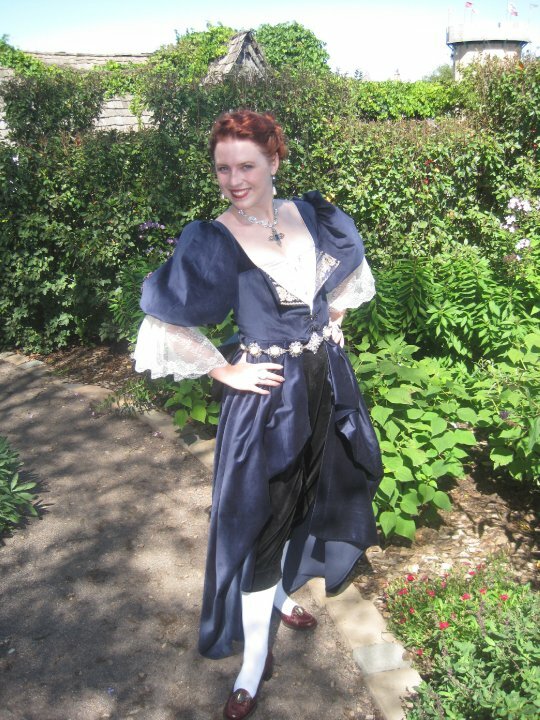 But by far my favorite use of linens goes to My Faire Lady who turned three shower curtains into a stunning gown in a mix of Elizabethan and Venetian styles. Added bonus? It can get rained on! The next time you are feeling frustrated by the lack of fabric in your house, try checking the linen closet. You might be surprised to discover that what you needed was right there the whole time! Well, now I know what to do with those old curtains and bed sheets that no longer have a bed to fit on! Thanks!